This charming holiday home lies on the edge of pretty small village ofCisternino in Apulia, recognized as oneof the most beautiful places in Italy.From here you can walk in the beautifulold town with its narrow, winding streets and the many typical restaurants and small shops. 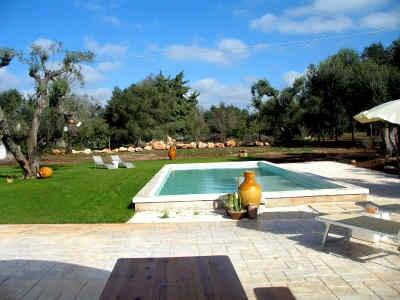 Despite its proximity to the old town of Cisternino Casa Angelina offerseverything for a relaxing holiday in the countryside: a large terrace, a lush garden with Mediterranean plants and a large orchard. For which there is an outdoor hot tub, (weather permitting) ready in usually from May to October. The house from the 18th Century has been completely restored by the owners and very tasteful furnished, some with antique furniture and divede in a double bedroom, two twin bedrooms, 1 kitchen living and a a shower bath. The location of Casa Angelina is the ideal starting point to discover the beautiful Itriavalley with its interesting places like Alberobello, Ostuni, Locorotondo to explore. Alo thegorgeous coast of Puglia, with its sandy and rocky beaches is easily accessible by car. Price incl. water, gas for cooking, electricity, bedline, towels, final cleaning. For the 5. + 6. person payable for each € 80.00/week. Payable on site: heating according to consumption, security deposit € 200.00.